This history was written by Edna (Benson) Eckles for presentation on January 9, 1972, at the closing of the Webster Methodist Church. Transcribed for Madison County IAGenWeb by Donna J. Crow and edited/formatted by Kent Transier. Some time ago Ward, our pastor, asked that Hazelle Crawford, Marie Sawyers and I collaborate on research and reporting of the beginnings and service of the Webster United Methodist Church. This has been for me interesting and very worthwhile. I have almost been able to see these people of early days being faithful to and working in the service of this early church. But frustrations were also a part of the experience, for at some points interesting details have eluded us. discipline and all service is rendered to the glory and honor of the church as God’s workhouse here on earth. The outreach of all these various areas is the Church. The bulletin board on the lawn tells us that this Church was built in 1889, which is 83 years ago. However, the Webster Congregation is older than that. We have no early records, but it could be many years older, for this congregation was meeting and having services at the Drake School house for an unknown number of years. Ministers of various denominations conducted services and served as pastors. The two leading groups seem to have been Campbellites and Methodists. We must remember that in this day a man’s belief was very important. This strength of conviction ran deep and sure. One individual told me of hearing her mother tell about the minister of the Webster Church warning his people about an excess of denomination which might “take over”. Ethel Howard has told of her own personal heartache of having to walk past Webster Church to go on to another church. This must have been especially discouraging when plodding through mud. The original name of the church was Webster Methodist Church. When the town of Webster became large enough to warrant a Post Office, the town name was changed to Middle River because there was already another Webster, Iowa Post Office. 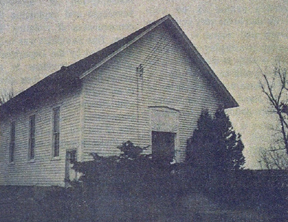 Correspondingly, the name of the church was renamed the Middle River Methodist Church and remained so until the Middle River Post Office was closed at which time it reverted back to Webster Methodist Church. The lumber for building the new church was hauled by wagon and teams from Winterset. Originally the church had a belfry and a bell. I wish it were still there. Why it was removed many of you know. The carpenter who built the Church was Max Hockenberry. As told to me by people now living, but recalled from parent or grandparents or other acquaintances, these are some of the men who assisted: Shaw Binns, John Sawyers, Abraham Dennis Drake and Harry Falkner DeVault (grandfathers of Cecil & Loretta Drake. ), Ellis Crawford, and Joseph Crawford. Joseph Crawford was a Quaker from Pennsylvania and never joined the Methodist Church, but Mrs. Crawford was a member. Jake Crow, also a carpenter, helped. There were no doubts many others. Dedication services were conducted by Rev. H. D. Preston. The first Sunday School Superintendent was Charles Gaymon. Average attendance was 100. A Ladies Aid was organized before 1912. Some early officers were Mrs. Fox, Mrs. Bingaman and Mrs. Donna Ramsey. The Sydney Morris’s recall three ministers who served the charge prior to 1914. There were Reverends Smith, Clearwater, and Williams. Rev. Clearwater lived on Highway 92 (then the Bluff Road). Marie Sawyers recalls that Rev. Clearwater was present at a last day school picnic at the Young School. These early ministers often participated in public gatherings as a means of communication other than from pulpit to pew. Nina Drake and Carie Hart were married by Rev. Clearwater on December 1, 1909. Rev. Smith drove from Winterset and Mrs.
Morris recalls that Nona Crow stayed with this family while in high school. Rev. Williams is only a name here but is recalled by Gen Hart’s father at West Star. The record shows Rev. Perkins pastor of Webster for one year 1914. On March 12th, 1914, Rev. Perkins conducted funeral service for Alfred Young, Marie Sawyers' father. She was 14 years old at that time. Rev. Perkins is recalled as having been somewhat impatient with young people, especially boys and some of them capitalized on the situation. Rev. Pruitt became the next pastor in 1915. On October 28, 1915 Amy Estel was married to George Drake. During Rev. Pruitt’s pastorate, a camp meeting was held. The huge tent was located southwest and next to the Church. Another version places the tent in the woods north of the Ramsey home. To supply seats and a rostrum for the meeting, lumber was borrowed from Andy Sawyer who had just hauled lumber to build a barn. People gathered from many miles distant to attend the meeting and many converts professed their faith. The meeting was conducted by an Evangelist. Mrs. Sydney Morris explained that in this day converts were not taken into the Church but placed on probation. Many pastors did not follow up with the baptismal rite and Church affiliation. Some probationers assumed church membership. Discovering that a departed member of the family had never actually joined the Church was frequently the cause of hurt feelings for the family. One Minister told that he spoke of the departed as "affiliated" with the Church. Rev. Pruitt followed the camp meeting later with a baptismal service at Middle River. Pearl Morris, Angie (Estel) Beaman, Amy Estel, and Bernice Ramsey were among those baptized. At this time, the baptism was held at the river so that those desiring immersion could have the rite in which they believed. Rev. Griggsby followed in 1916. Marriage ceremonies were conducted on Feb. 25, 1916 for Hazel Young to Bert Black. On Dec. 21, 1916 Angie Estel was married to Elden Beaman. Rev. Barnes, 1917, lived at West Star, and at this time Webster and West Star were his charge. Dec. 21, 1917 Marie Young was married to George Sawyers. Sydney Morris followed in 1919-1920. I visited with the Morris’s one afternoon and they had many memories of this Church. Mr. Morris' memory is of many faithful working members of this Church. Some of them mentioned were Ora & Nina Hart, Fred & Nona Eyerly, Merton & Pearl Cline, Vera Nelson, Charles & Carrie DeVault, the Frank Fox family, John & Elizabeth Estel, Goldie & Ellis Estel, Shaw Binns, wife Emily and son Ray, and Ellis Crawford. Sydney spoke of how Ellis would walk to church carrying kindling for starting the fire. Ellis had to go very early, in order to have the meetinghouse warm for the congregation. Of course, I presume Beamans, G. Sawyers and Geo. Drakes and others were the younger married members. Mr. Morris also spoke of Mr. Frank Busch, who though a staunch Campbellite, came here for church and was a class teacher in the Sunday School. As a girl Mrs. Morris recalls walking with her sisters Grace and Mable to Webster Service. Social activities were few and she enjoyed the choir music. She recalls these choir members: Mabel Nelson (organist), Orville Nelson, John Drake, Ira Crow, Mata Gaymon, Jimmie Gertie Binns, Verdi Howard Craven and Gertie Howard Fox. Orie and Nina Hart, and Bert and Emma Holland. Rev. Rower became pastor 1931-1933. Rev. Rowe was especially admired by Elden Beaman. When Elsie and Claude were married they honored Elden by driving to Guthrie Center to be married by this minister. Rev. E. J. Zunsteg was pastor when we came here in ’36. Ora and Zola Lowden joined this Church during Rev. Zunsteg's pastorate, and Zola was superintendent during part of this period. Now, in 1939-1941, Rev. Reep, a young college student, quiet and reserved was our pastor. Don and I jointed the Church during his pastorate. This was also the time that the Ladies Aid was reorganized into the W.S.C.S. On September 1, 1940 the Webster ladies Aid Society met at the home of Zola Lowden for the final meeting of this organization as such. This day was the end of an era for these women. At a previous meeting the members had voted to join with other sister societies of the state and nation to become members of the new organization of Women’s Society of Christian Service. Where formally our activities had been working to give financial aid to the church, and minister to community needs, we now in addition would learn to budget, pledge and most importantly study. Twenty-six women filed by the table to sign the Charter, thus becoming Charter members of the Women’s Society of Christian Service. Later fourteen more ladies signed. Our society now number forty ladies, ten of whom are present members. About fourteen years later, during the pastorate of Don Cutler, Hazelle Crawford was contacted by Mrs. Cooper, wife of Dr. Cooper, Creston District Superintendent, for service as a district officer. For the next nine years, Hazelle served at the district level. Her first four years were served as promotion secretary and president for two years. At this time, Webster Church was transferred from the Creston District to the Des Moines District. Soon after this transfer, Hazelle was asked to be treasurer of the Des Moines District W.S.C.S. After two years, she became the president where she served for three years before retiring. As I was reading through the Sec. & Treas. Reports, I noticed that soon after the new WDCS was organized, we as a church began to change a few things. We began in a small way, but here and there, as we went forward, we really accomplished many needed improvements. Our first small beginning was a furnace plus a circulating jacket which replaced the old coal heater. This type of unit was chosen because it could be used in a basement, when and if, later it was so used. As we think of this period of change, I believe it came about from a conviction that our worship home should be in keeping with our own homes. Our greatest undertaking was the basement. August 13, 1947 at a WSCS meeting there was a discussion about moving the church. Someone was appointed to contact the proper Church officials as to the wisdom and possibility of this idea. I recall that someone stated later, “We can’t get across the river with the church.” A notation in Nov. 1947, Nina Hart reopened the subject of building a basement. Motion made and carried to appoint committees to inquire and determine the amount of contributions needed for this possible project. These women were Zola Lowden, Myrtle Williams, Edna Eckles, Madge Stever, Hazelle Crawford and Gen Hart. I do not recall that this committee ever functioned. I rather think the men took this project in hand. Another notation in WSCS minutes states that Nina Hart reported that there would be enough blocks to separate the furnace area from the kitchen and thus the I-beam could be shortened and cheapened. The Sunshine Garden Club held an ice cream social and gave the money to buy the I-beam. This was part of the beginning of our social area. Many hands contributed to these accomplishments. Many who were not members came at one time and another to help. This Church is of the Webster Community. An altar was built, carpet was laid, and in 1954 our lovely painting (seen at right), which has added so much to the mood and Sacredness of our services, was presented by Madge Stever,. Now we continue with Rev. Hartin 1942-43, a product of West Virginia coal mines. This was a man who was self taught and was minister by right of service rather than schooling. He was a camp meeting type. Rev. Hartin had been a coal miner who was paid Saturday night and broke Monday morning. I have seen tears on his face at the memory of what his life had been, for he’d been an alcoholic. It had taken ten years to win that battle, so he told me. Rev. Hartin was followed by Rev. Crouse, who came to the charge in July of 1946. On April 6, 1947 Doris Egger along with Bill Eckles, Joan Crawford and Laura Mae Crawford were admitted to membership. Some time during this period the night preaching services were discontinued. Previously the three charges had rotated each four months on the evening, ten o’clock and eleven o’clock service. The evening service was so poorly attended that a nine o’clock service was begun at Webster. For some this hour seemed a hardship. But eventually we adjusted and rather liked it. Rev. Ben Hamilton came to our church in 1948. Mrs. Hamilton and son Leo, a teenage lad, were usually with Ben and we enjoyed the whole family. Leo, who was considering the ministry, conducted the Webster nine o’clock service the last few months of Rev. Hamilton’s pastorate. During Rev. Ben’s ministry the year 1948 these young people were admitted to church membership. John Hart, Annette Stever, Loretta Stever and Alice Roberts. The following year Lois Hart was also admitted. Rev. and Mrs. Knight were a newly married couple with little if any furniture for their home. I recall that each charge contributed furniture and the Knights moved into the Hebron parsonage. This young couple were especially interested in the young people, and Mrs. Knight was very helpful in the Children’s Bible School work. 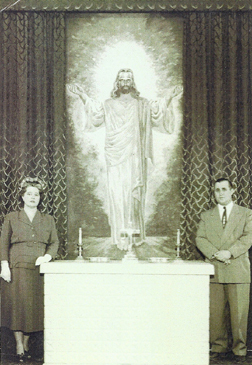 On an Easter Sunday in 1954, during Don Cutler’s pastorate, we were presented with our beautiful life-size painting of Christ. We all remember that Sunrise Service Easter morning when the sun shone through the eastern window of our church to light the altar. Rev. Earl Streyfeller and wife, Wilma, were here 1955-57. This minister is recalled as one who visited many people, talked of the fellowship of Jesus and the brotherhood of the Christian Church. He seemed to sense where need and trouble were, and went there. During Rev. Streyfeller’s pastorate on March 30, 1956 on Good Friday evening, the following people were united with the Webster Church: Gary Beaman, Mr. & Mrs. Delbert Dolson & daughter Doris, Richard Hart, Shirley Hart, John and Wilma Holtmyer and sons Darwin and Lee, Ludwig and Della Horn, Billy Martin, Karen Martin, Janice Steve, Steve Stever and Betty and Shirley Sillbaugh. Easter Morning April 1, Wayne and Mary Griffith also united with this congregation. Today, with the exception of Steve Stever and Doris Dolson Rinard, each one of these members has transferred out to other churches and no longer resides in this community. This seems to be a pertinent explanation of what has and is happening to the Iowa rural church. Rev. Don Enright and family followed. This young man was about 6 feet 4 inches tall. In the pulpit, he stood very very tall, and with a long arm and long finger pointing heavenward, seemed to almost touch the throne of God. He had the disturbing ability of being able to make one take a long look at one’s self and not like all that was seen there. 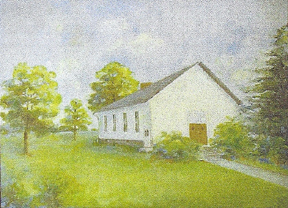 In proportion as Don Enright was able to lead the congregation to re-evaluation and learn a little more “to walk humbly with they God”, did the Webster Church grow in stature. Rev. Kelly and Rev. Lint were our next pastors. Both were men of ability and had many friends among the congregation. The Lint family lived in the parsonage at Worthington. At this time, Webster Church was transferred from the Hebron charge to the West Star – Worthington – Webster charge. Now, along with Worthington and West Star, Webster had a new experience. To say that we were surprised to see this dark-skinned young man from India in our pulpit would be an understatement. This was a life-sized lesson in race relations for us in this Midwest farm community. But when Shan Parmer, wife Angie and three small children left, from Webster to India, hands had reached and touched halfway around the world. Again, Webster Church had grown in stature. Rev. Milton Haedt, our next pastor, definitely filled a need in this church. When he left us to go to Kansas City for study, he worked in the inner city where the problems are many and danger is often near. He, along with Sydney Morris, was one of our two returning pastors. Milton has not been in the ministry for the last two years. Our present pastor, Ward Young, his wife Nancy and four children are beginning their sixth year on this charge. Ward has been with us on festive occasions, our last communion at Webster on Dec. 26, 1971 and loss of our loved ones, and many other occasions. We leave this church with sadness, but grateful for the lessons learned here from the pulpit, and living life. The decision to close our church was not an easy one. Death and transfer of many to other communities have been contributing factors. Generations of families have grown up here. But as we go to our new church home, I believe we take gifts of experience in love of God and fellow man which have in part been learned from these ministers and especially from our present pastor, Ward and wife Nancy. Ward has quietly preached the same gospel which Don Enright so emphatically brought, and has helped us break the shells which we Christians often wrap about us. This is only a part of the service and functioning of the Webster United Methodist Church. These are only a few of the people born, living, growing, marrying, working and serving who have been the Webster Church. The Webster Church closed Sunday, January 9th, with a large crowd in attendance. Many former members and friends from Greenfield, Creston, Earlham, Omaha, Macksburg, St. Charles, Dexter, Casey, Fontanelle, Adel, Des Moines, Wathena, Kansas, Winterset and the community were present for the service. The closing service was of commemoration celebrating the life and service of the people of this congregation through the years. Rev. Ward Young, pastor for the past five years, was in charge of the service. Music was furnished by Mrs. Carl Binns and Mrs. Richard Hoadley, each singing solos accompanied by Mrs. Floyd Hart. Letters were read from former ministers, members and friends who could not be present by Mrs. Claude Beaman. A history of the church, compiled and written by Edna Eckles, was presented. Many who had been former members of the church told of memories of the days they had attended the church. Rev. Young gave a short tribute to the church and community. Mrs. Lois Thompson sang the “Lord’s Prayer”. A social hour was held in the basement. This page was created on November 8, 2011. This page was last updated Thursday, 19-Jan-2017 18:06:46 EST .